There are still come companies making these. I'd buy one in an instant except they wouldn't look right in an actual dining room, and my kitchen is too small for one to fit. Just don't let your cigarette fall out of the ashtray and burn into the surface! We had a wooden picnic table and two benches in our dining room. 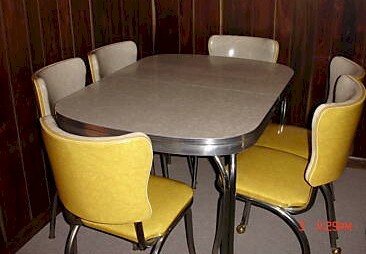 Still miss our Walter of Wabash table with parabola upholstered chairs and saturn ornamented legs ; it just fell to pieces after too much love in the late 1980's just before I began to really appreciate such things. My dad made a Formica Coffee table in the late 50's and I have it now. I'll pass it on to my son. 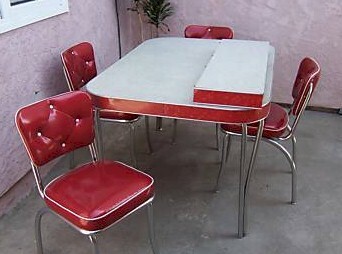 It still looks great - apparently formica is indestructable. Americana at its best. The table was almost indestructible. Right, Tommie, and same with the clear plastic slipcovers. ...and if you came in the house after playing outside in the hot summertime, and sat down for lunch without a shirt on, your back would stick to the vinyl upholstery. When you leaned forward, it sounded almost like velcro being pulled apart. I remember the cracked upholstery on the seats pinching me too. Except when the chairs got a crack in them and that hurt our little "bottoms!" lol! I love these!! Wish I had it now.